After the Fred Hughes 10 in January, my knee/hip flared up with an injury that I’ve been rehabbing ever since. That means I haven’t run over 10 miles/week in about three months — at least I’ve been able to cycle, swim, and strength train — but I’d registered for the Victoria Park Open 5 on 19 April and by gosh I was going to run it! pre-race photo by Brian B. The course was two figure-eight laps of east London’s wonderfully flat Victoria Park. My goal was to finish the race with little to no knee pain — I hadn’t run more than about 4.5 miles at a time since January, so my expectations were low in terms of time and I mainly hoped to get around pain-free. Probably because of my low expectations, I felt relaxed at the start and ran a comfortable first mile in 7:10. My second mile was a little slower, however, and around 16:00 my knee started to hurt. I worried that I’d have to drop out as it was less than halfway through the race, but I eased off and hoped the pain would recede, as it sometimes does. Around mile 3 (which I went through in 22:25) the pain did go away. I ran the fourth mile in ~7:45 but my knee felt okay by then so I picked it up for the last mile, which ended up being just under a 7:00 mile and brought me into the finish at 37:00 (7:24/mi pace), 131st/192 and 17th/56 woman. Our women’s team of Caroline, me, and Barbara came second, and our men’s team came third. Great job, everyone! I’m pleased with my race, which was only 1:15 off my PR/PB despite my low running volume. Now back to the rehab exercises and track workouts so I can run a good Crouch End 10k next month! 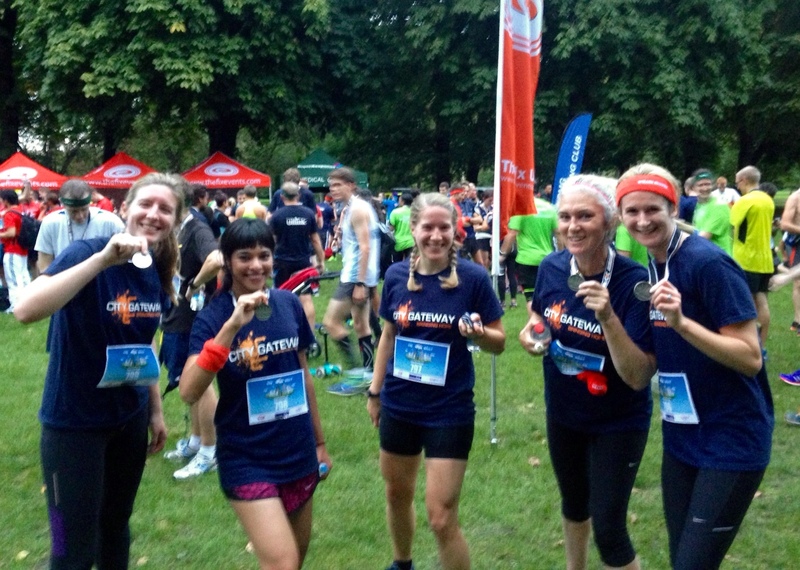 This entry was posted in climate, exercise, health, pictures, Race Recap, running and tagged Victoria Park on 20.04.2014 by taplatt.